Sugarpot Beauty: Beauty on the Cheap - Sephora Sale! I strolled through Sephora on Monday, and took advantage of their Sephora+Pantone Universe Sale! Yes, orange was the trend this past spring, but I didn't like the color for spring. To me, it felt like a re-run of the fall and winter season we had just come through, and I wanted fresh, bright colors, not more plums and browns. Granted, orange is definitely NOT brown, but to me, these colors say fall. Also, these colors are much more vibrant in person. The photographs certainly wash them out. For a total of $16, though, this eye quad and nail quad can update your fall looks and toss a punch of color into the mix! I think that is a pretty good sale, and wanted to pass it on! 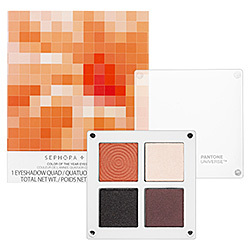 A luxurious eyeshadow palette with an ultra-smooth texture and tangerine-inspired hues. Transform your eyelids into pure silk with these creamy, lightweight shadows. Micronized pigments deliver rich color and unprecedented blendability to ensure comfort and a flawless, luminous finish. The brilliant shades were inspired by Pantone’s Color of the Year, Tangerine Tango—a juicy, vivacious orange sure to brighten your day. Shadows range from creamy matte to a frosted shimmer, each promising bold color that lasts. The palette’s ultra sleek design is a nod to the iconic Pantone chip and the unique embossing is an architectural interpretation of a tangerine’s voluptuous, layered shape. 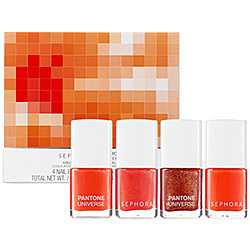 A playful collection of four nail lacquers in tangerine-inspired shades. Flaunt a variety of gorgeous nail looks in the 2012 Color of the Year, Tangerine Tango, with this set of bold polishes. Adorn your fingers and toes with the vivacious reddish-orange in four different finishes, from creamy and matte, to glitter and shimmer. The rich color provides beautiful payoff with just one coat and the formula is formaldehyde-free. Combine polishes to create your own unique design and dance your way into the New Year with this spirited shade.